It’s been a little over a year since Prop Hunt arrived in Call of Duty: Modern Warfare Remastered as nothing more than a silly, April Fools’ Day weekend event. Since then, it’s become a permanent institution in three different games in the series. You might think it would be too much of a good thing, but the mode still holds strong as a fan favorite in 2018. Prop Hunt lets one team disguise themselves as random props on the map—trash cans, trees, paint buckets—and they must blend in with the map’s décor to avoid being killed by the opposing team of hunters. It could be the most ridiculous game of hide-n-seek you’ll ever play online. Over 50 percent of the Modern Warfare Remastered player base was prop hunting that first weekend, and the mode was so well-received that it became a permanent addition to the game. Players wanted to be literal trash. It’s easy to see how this wacky mode became a fan favorite in such a competitive shooter. I’ve been playing Call of Duty with the same group of friends for years, and sometimes we play objective modes like Capture the Flag and Search and Destroy a little too seriously. We scream callouts, argue about stealing each other’s kills, and even shush each other when we’re the last player alive. We’re great friends, but we get really competitive for the win. Prop Hunt is the mode we can choose to just laugh and unwind. As silly props, we hide and talk about random things as the opposing team tries to hunt us down. As the hunters, we still do our callouts and try to win, but we can’t help but crack up at the sight of a dumpster or bicycle scooting across the map in hopes of avoiding our gunfire. The constant moments of humor mean the mode is just so much more chill to play. This could easily be the reason many people enjoy Prop Hunt—hoping to simply have a few good laughs with friends without cranking up the adrenaline too far. Given Prop Hunt’s refreshing vibe, it’s not really a surprise to see the mode added into other entries of the franchise. Call of Duty: WWII received Prop Hunt in late January, and it recently arrived in Black Ops III on May 1 as part of the Operation Swarm event. But not all Prop Hunts are created equal. Prop Hunt feels different for each of the three titles, and each game has its own special perks. Classic Prop Hunt. While I commend the later versions of Prop for adding better features, nothing beats the hilarious hunt for trash bags and dumpsters on Modern Warfare Remastered’s maps. There’s just something really fun about being garbage, and the multiplayer maps of this installment are littered with all kinds of trash. The hitboxes on some of the props can be really frustrating as a hunter—especially that tiny little hookah with the speed and agility of a cheetah—but I’ve never laughed so hard while struggling to get kills in Call of Duty. The original is still Prop Hunt at its best. The main game went with a more serious and thematically appropriate take on war, so a silly match of Prop Hunt can be a refreshing way to counter the gritty and gloomy ambiance of the multiplayer maps. Sledgehammer Games also made some smart tweaks to the original formula, adding a minigame to entertain the hunters while the props are busy hiding. Yes, it’s just simply spamming a button to raise your PSN ID or Gamertag to the top of the screen, but the thing about Call of Duty players is that they can and will turn anything into cutthroat competition. WWII also rewards players for taking on greater challenges by granting survival bonuses if players choose to hide as the more obvious medium and large-sized props. The extra experience points feel satisfying when you’re trying to blend in as a giant tree stump. You can also drop up to three decoys of your prop to distract or toy with the hunters. The well-thought-out changes improve the experience overall, but I do find I laugh a little less with WWII prop hunting. The 1940s décor of these maps leave you often spawning as a tree, a stump, a log pile, or something else not quite ridiculous and trashy enough to be off-the-charts hilarious. I still have a great time playing this with friends, but the mode lost a tiny bit of the charm in the WWII setting. Once Prop Hunt started showing up in other games, I got to wondering how it might work in a game like Black Ops III, which uses advanced movements like sliding, boosting, and wall runs. A couple of days ago, we got our answer: It (mostly) works. Treyarch’s iteration continues to improve on the formula tweaks provided by WWII Prop Hunt, with are more advanced “waiting for the other team to hide” minigames that let you shoot floating orbs on the map. One version wants you to rush around and destroy the most orbs, while another wants you to chase and deal the most damage to unbreakable orbs. This feels like a pretty satisfying way to kill time while waiting for the props to hide. Some larger props have created awkward camera angles in the past that made visibility an issue, but Black Ops III Prop Hunt lets you turn your prop invisible for your own personal view, so you can better see if an enemy is approaching. 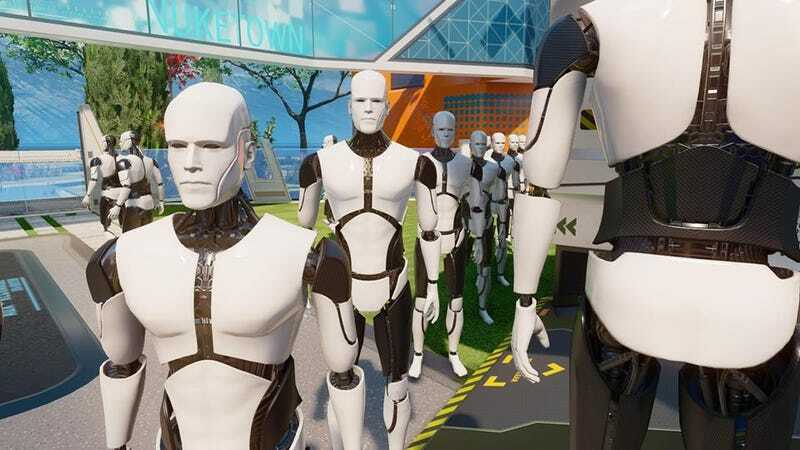 The fan-favorite Nuketown map even has its own version of Prop Hunt, disguising all the props as mannequins. The map has a ton of mannequins as part of the décor, so now players spawn as one of the creepy display figures with the ability to place nine decoys of themselves. It’s hard to hide mannequins on this small map, so the matches play out pretty quick. The advanced movements make for a great pace, allowing you to slide, boost, and wall run to an area faster. However, I do have mixed feelings about props being able to boost, wall run, and lock into place in tricky hiding spots. I feel like I’m constantly looking up to try and spot my opponents. I think limited boosting would make this a less frustrating experience, but I still have a good time overall. There’s usually a fair amount of community hype whenever Prop Hunt is added to a game, and the mode is usually a ton of fun no matter which version you play. But perhaps there is such a thing as too much of a good thing. As much as I enjoy Prop Hunt, I think it would be better served as originally intended—as a special limited-time event that pops up occasionally. When it was a special, limited event, Prop Hunt could get 30 to 50 percent of the player base involved all at once. As a permanent mode, it’s not as popular, even though I can usually still find a match. Permanent Prop Hunt is kind of like eating your favorite dessert every day. You can’t get enough of it in the beginning, but eventually you become sick of it and move on to something else. I think the hype and participation would remain steady if Prop Hunt was available as a once-a-month or even bi-weekly event instead. And of course, my preferred version would still be running around as trash in Modern Warfare Remastered.